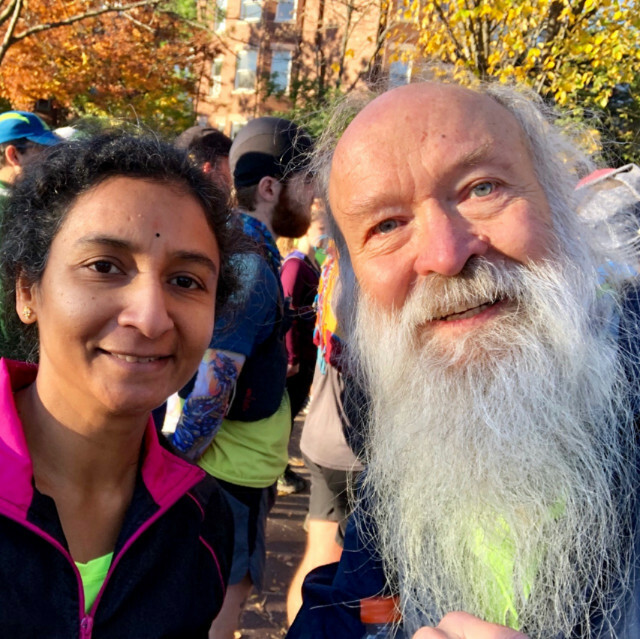 The Virginia Happy Trails Running Club is a low-key fun-oriented group, and this year's Potomac Heritage 50k — of which Roadkill does ~40k — is an archetypal VHTRC event. Begin in the center of Washington DC, near the Mount Pleasant home of Race Director Tom McNulty. Run down Rock Creek Trail, then head west through town to the Potomac. Cross into Virginia at Rosslyn and follow the Potomac Heritage Trail ~10 miles to the I-495 Capital Beltway bridge, then return. What could be more fun? Well, maybe not-falling-down too often? 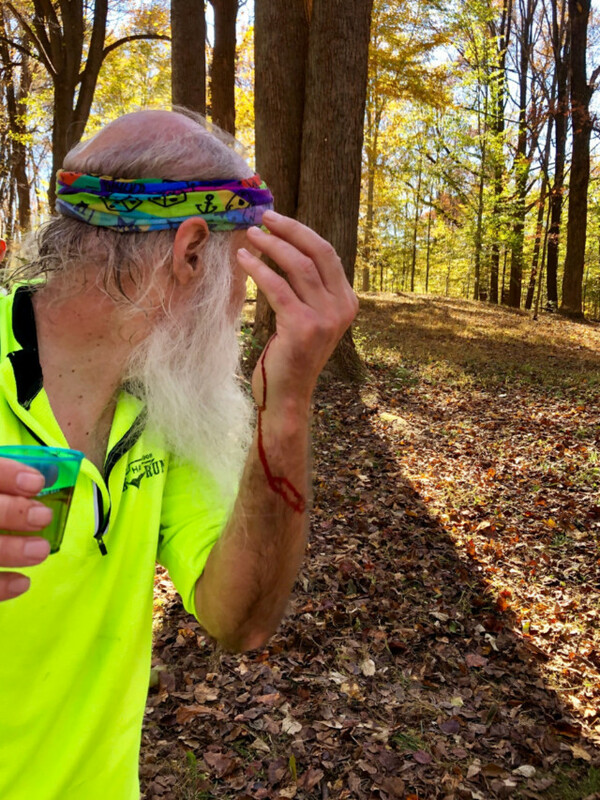 Here, at the Turkey Run aid station, Roadkill looks about before quaffing a Fireball cinnamon-flavored whiskey. A trickle of blood on one arm records several stumbles on technical sections of the trail. Despite some tipsiness (whatever for, one wonders?) the remaining miles turn out OK! Friends gather before the race to exchange greetings and hugs and fist-bumps, catch up on gossip, and share plans for upcoming races. Indomitable ultrarunners Caroline Williams and James Moore pose with Roadkill. Emaad Burki and Ken Swab are here and anticipate ~20 miles. Steve Gadd goes the whole way. Awesome Sirisha Golla is at the starting line and kindly pulls Roadkill along for most of his journey today. She sets a brisk pace and we make the cutoffs together, or are close enough to be allowed to continue. Trail talk among good friends is delightful, as always. At one point while leading Sirisha trips on a concealed tree root. A few seconds later, Roadkill hits the same snag and takes an identical fall! Matchy-matchy! 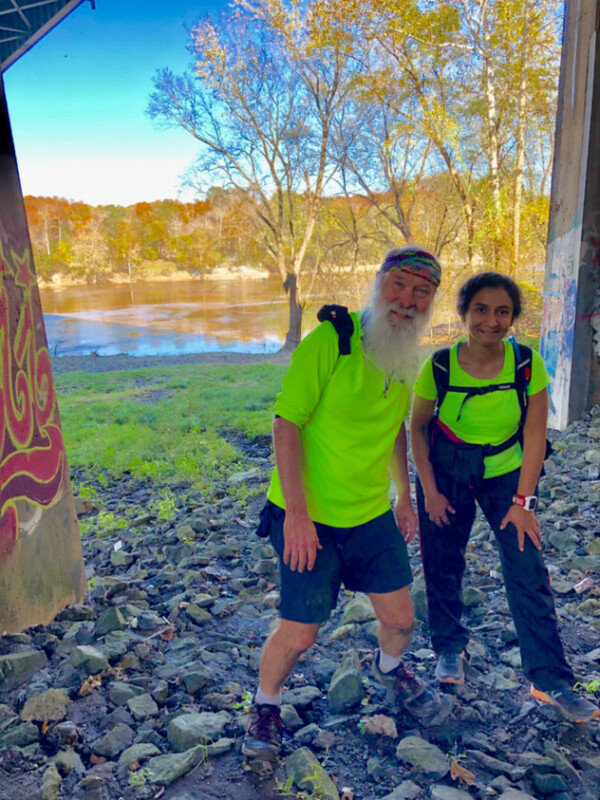 At the American Legion Bridge, Sirisha and Roadkill show off their color-coordinated outfits. 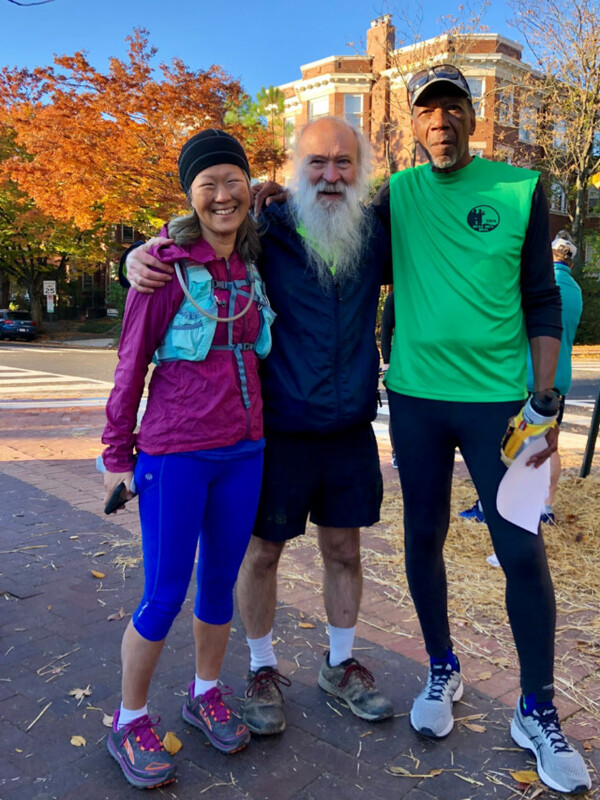 Sirisha goes on to finish the entire 50k, in the Position of Honor as dead last after ~9.5 hours among all who do the full distance, according to the official results as posted. Roadkill is top among those who drop out. He stops at Chain Bridge at ~7.5 hours, helps pack up the aid station there, and hitches a ride back with a helpful volunteer. He's slow and a bit achy today, forgot to bring a flashlight, and fears the dark of the final miles. And by punching out now, he can get home in time for a dinner of TexMex at Chuy's to celebrate with dear friends Jon Jester, Amy Couch, and Stephanie Fonda. Yes, and it's all good!